JAs, Muslim Americans hold solidarity event in Venice. Members of Girl Scout Troop 5325, along with youth from the Venice and West L.A. community and former World War II incarcerees, present 1,000 origami cranes to Mohammed Abdul Aleem of King Fahad Mosque in Culver City. Left: A performance by Nakama Daiko opens the program. 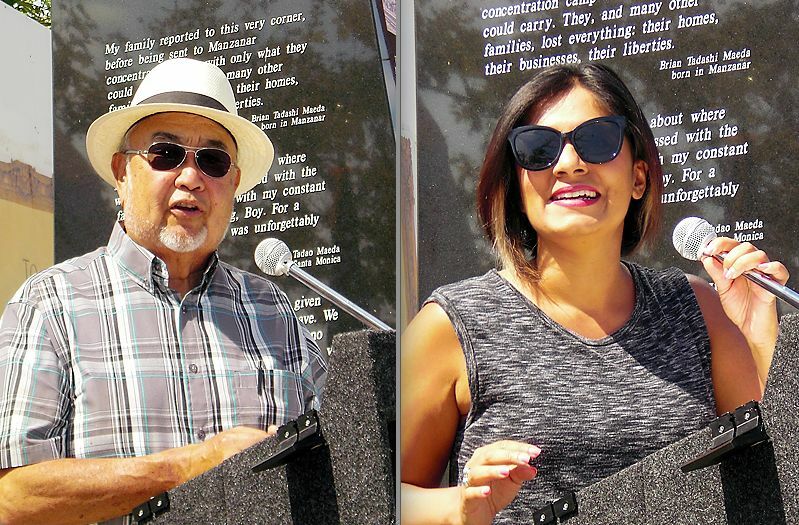 Right: Community activist Tanzila “Taz” Ahmed was one of the keynote speakers. 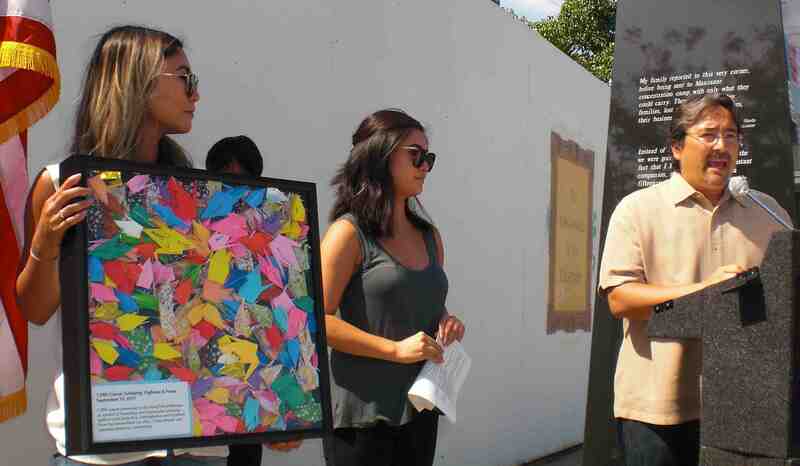 To mark the 16th anniversary of 9/11 as well as the 75th anniversary of Executive Order 9066, a gathering titled “1,000 Cranes: Solidarity, Vigilance and Peace” was held at the Venice Japanese American Memorial Monument on Sept. 10. 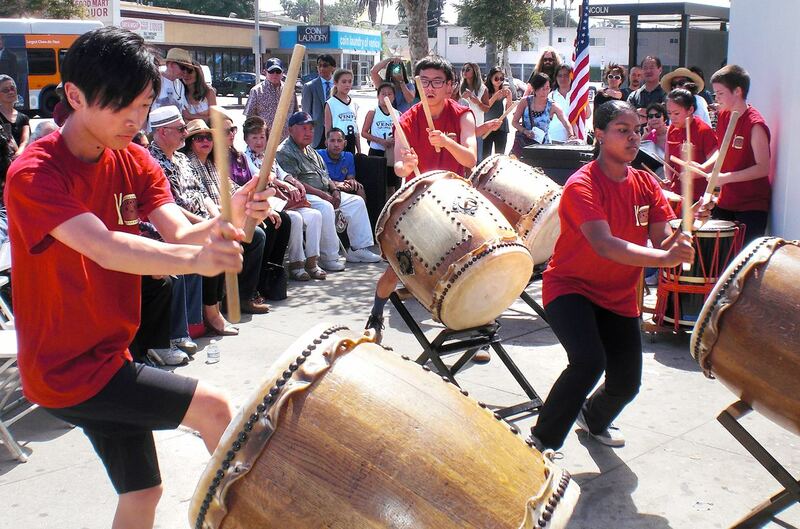 The event on the northwest corner of Venice and Lincoln was organized by the Venice-West Los Angeles JACL, Camp Musubi and the office of City Councilmember Mike Bonin to show solidarity between the Japanese American and Muslim American communities. A performance by Nakama Daiko opened the program, with Tomomi Hongo introducing the performers, followed by a flag salute led by Girl Scout Troop 5325. Attendees included kids who had participated in Camp Musubi’s Family Fun Day two weeks earlier and folded a thousand paper cranes. They were joined by former World War II incarcerees May Kakehashi, Arnold Maeda, Dr. Jimmy Hara, Jean Shigematsu and James Yamamoto. A performance by Nakama Daiko opens the program. Former President Obama’s recent tweet quoting Nelson Mandela — “No one is born hating another person because of the color of his skin or his background or his religion … People must learn to hate, and if they can learn to hate, they can be taught to love” — “was so accepted and was so readily embraced … because it was a simple, positive message,” Furutani said. 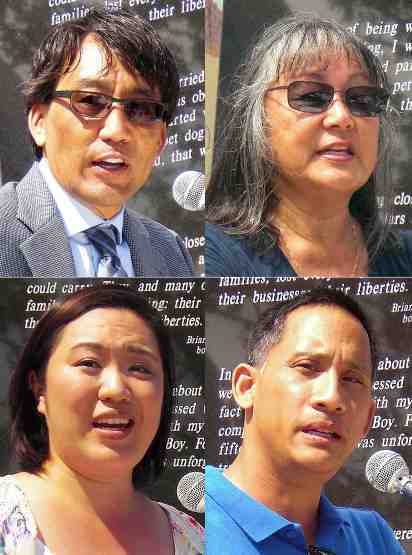 Speakers included (clockwise from top left) John Saito Jr., Venice-West L.A. JACL; Phyllis Hayashibara, VJAMM Committee; Len Nguyen, representing Councilmember Mike Bonin; Stephanie Nitahara, National JACL. The Bridging Communities program, a collaboration between JACL, Nikkei for Civil Rights and Redress, Council on American-Islamic Relations, and Kizuna, “brought together Japanese American and Muslim American high school students to learn about their cultural and religious identities as well as each other’s community histories as well a as examine parallels between post-9/11 and post-Pearl Harbor,” Nitahara said, adding that the program has spread to Northern California, Seattle and Chicago. 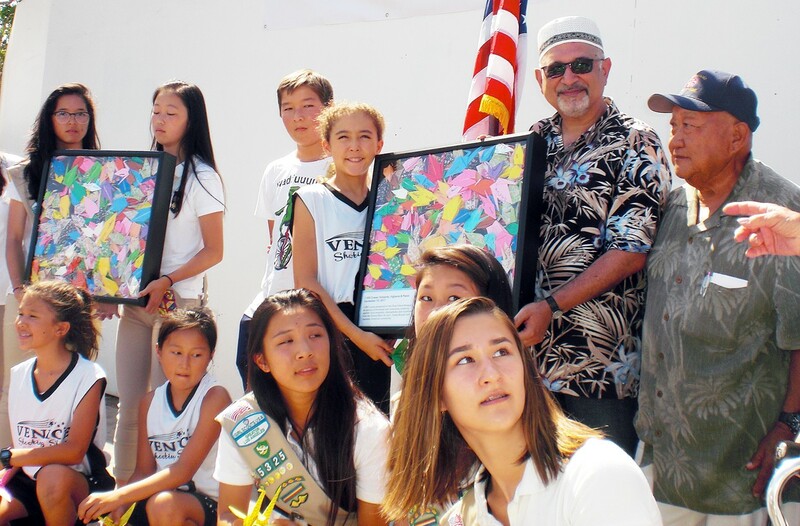 Annia Yoshizumi and Amy Watanabe of Venice-West L.A. JACL organized the event with Tony Osumi of Camp Musubi. 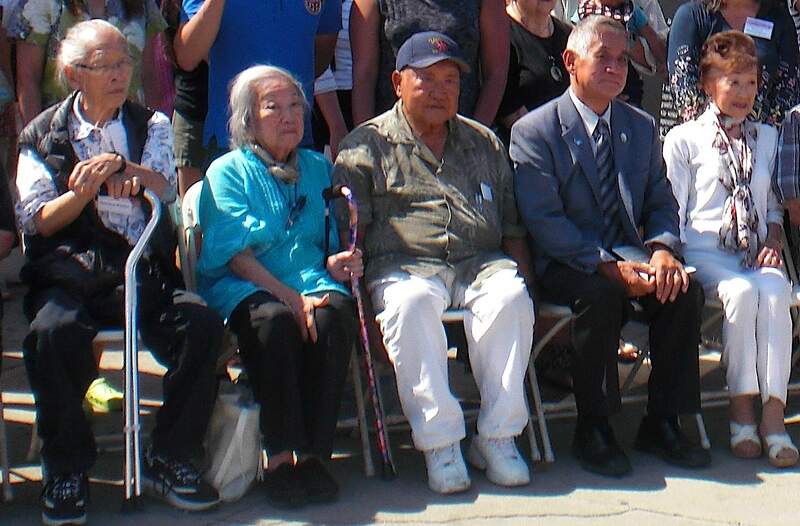 Former WWII incarcerees (from left) Arnold Maeda, Jean Shigematsu, James Yamamoto, Jimmy Hara and May Kakehashi. The cranes, a symbol of peace, were presented by Girl Scouts Ally Yamashita, Iris Hirata, Amanda Matsubara, Jacklyn Oldoerp and Lindsey Kojima to Mohammed Abdul Aleem of King Fahad Mosque in Culver City and his family. In regards to hate crimes, and CAIR, their latest report is claiming nearly 600 percent increase in anti-Muslim “incidents”, and a 44 percent increase in anti-Muslim “hate crimes”. Things that are not considered hate crimes by the police. Things that are not considered hate crimes by the people involved. Incidents that do not involve Muslims, at all. And, incidents that have no witnesses, videos, or any supporting evidence. The focus of CAIR’s report, 2016 was the occurrence of the deadliest terror attack in U.S. history since 911, the Orlando Nightclub Shooting. CAIR’s premise that Muslims are being attacked by Americans in record numbers is completely false. It is Americans that are being attacked by Muslims in record numbers. There is not one death recorded in CAIR’s report. CAIR contributes nothing to the victims of assault, but, instead, promote themselves, along with fear, and resentment. CAIR was found to be connected to Hamas by U.S. District court judge Jorge Solis. The current executive director of CAIR National, Nihad Awad, was an attendee at the 1993 Philadelphia Meeting, a summit meeting for the Hamas leadership in this country. At this meeting Nihad Awad gave a presentation, where he said one of the goals of the group should be to give legitimacy to Hamas. CAIR is currently involved in a law suit brought by former CAIR clients who were defrauded by CAIR’s legal advice. CAIR is not a member in good standing of American society. They take every opportunity to side with America’s enemies such as allying themselves with Black Lives Matter, and calling for the removal of Civil War statues. Please do not put this terror supporting group on your program.